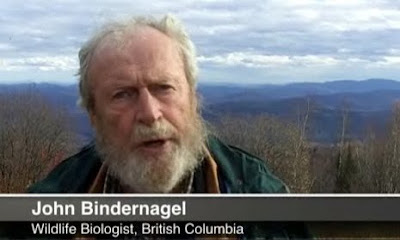 John A. Bindernagel (born 1941) is a wildlife biologist who has sought evidence for Bigfoot since 1963. He published a book in 1998 entitled North America's Great Ape: the Sasquatch (ISBN 0-9682887-0-7). Bindernagel grew up in Ontario, attended the University of Guelph, and received a PhD from the University of Wisconsin–Madison. He moved to British Columbia in 1975 largely because the region was a hot spot for Bigfoot sightings. Over the years, he has collected casts of tracks that he believes belongs to Bigfoot. He also claims to have heard the creature near Comox Lake in 1992, comparing its whooping sound to that of a chimpanzee. Bindernagel believes that the Bigfoot phenomena should receive more attention from serious scientists, but has remarked, "The evidence doesn't get scrutinized objectively. We can't bring the evidence to our colleagues because it's perceived as tabloid." Recently John Bindernagel was interviewed at the Ontario Sasquatch Conference on May 13th 2012, where he answers the usual questions about his faith in the realness of Sasquatch, where are the bones, etc. Then when it gets past the halfway mark he remarks on his decision to leave the Patterson/Gimlin out of his second book. While he maintains and supports the authenticity of the Patterson/Gimlin film, he adds that it is almost too controversial to put in a book. Especially if you want that book to be read by the scientific community. Watch below. You can purchase his books at John Bindernagel's Officlial Website. What I do not understand is why all these people who think they are authorities on "Bigfoot" assume they are also an authority on the opinions of fundamentalist Christians. The tendency of Christians is they believe in anecdotal evidence, which most of claims about Bigfoot are. This is like the assumption that religions would fall apart if it were proven aliens exist. You have to be very bigoted to make that assumption. The are many alternatives that are consistent with Christianity. For some odd reason, the bulk of scientists assume evolution goes a certain direction. More popularly, the notion is that somehow we evolved from primates rather than all primates having a common ancestor with humans. It could be the case that humans are the more primitive of primates and there are suggestions of that. Humans are less specialized to any specific ecosystem than other primates. Humans also have less variety in DNA than other primates due to a bottleneck about 70,000 years ago. They are not as good at running nor do they have muscle strength. They do not have the bulk needed to survive in colder climates, like the Neanderthals were. So, which came first? Were humans over 70,000 years ago more fit? There is another alternative. Perhaps some humans evolved into the modern "Bigfoot." If so, then they did not have to invent fire or specialized tools to replace teeth and arms and nails to tear apart food. You do not need to preserve food if you have it fresh. However, the possibility that humans degenerated into the Wildmen fits in well with many stories within Christian Scripture. I do enjoy reading your writings. I also respect a lot of what you have to say. I also know that any time the word Christian is brought up in this kind of context, it has the potential to start a fire. With that said, I heard what Doc. Bindernagel said and I agree with him. It has been my experience (personally) that the mere mention of a North American Ape will get you pegged as "One of those People" in the Christian community. My brother is a Christian minister and my father has been a devoted Christian for more than 25 years. My father, in fact, is in so much denial about the subject of Bigfoot, that he will not even admit it to me that he has actually seen them, and I was sitting right next to him. My father and I were coming home from a hunting trip one night, and came upon at least 2 and maybe 3 of them on the side of the road. One of the Sasquatch (the biggest) looked right in the cab of our truck, not more than 20 yards away (and it did not look happy). Anyway, long story shortened, to this day my father will not even entertain the idea that there is an "unknown" out there that could possibly have some human DNA. He will say "There is no way Sasquatch can be real because if it is and they have stayed hidden this long, then they have to be able to reason. If they can reason, then they must have intelligence, which must mean they would have to be part human. Therefor all humans have souls, and the God I serve would not let a soul go to hell without the chance to be reborn and baptized"
Try and convince the average christian that the world is 4.54 billion years old, they will look at you in disgust. Don't forget, it was not that long ago that a big percentage of self proclaiming , bible believing, church going christian's thought that dinosaurs were some kind of lie that the liberal media, and men of science made up to try and confuse the church.